How does one become a tennis champion? What does it take to become a world-class player? Countless coaches, parents, young players, federation officials, and fans of the game have asked this question. Yet, no consensus has been arrived at from those in the field regarding key components needed to be a champion and the sequencing of subsequent activities. Sport science researchers, however, have begun to scientifically study the issue and have identified keys for guiding the progressive development of a world-class player. This article will briefly discuss some of these keys. 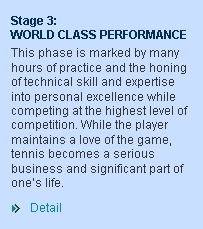 What is so interesting about these stages is that players do not begin the careers with championships in mind. 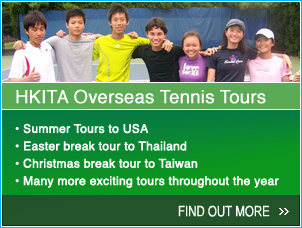 Instead, they become exposed to tennis, enjoy, derive satisfaction and fall in love with the game. Then after falling in love with the game, they progress into more serious and focused involvement. Thus, in the early years of involvement, the best way to produce a top player is to do the same things needed to grow the game with all children - encourage fun, fundamentals and involvement. Once this foundation is built, a more focused and intense approach evolves. One variable in the first stage that is particularly important to the ultimate development of the player is the acquisition of fundamentals. 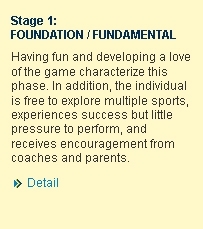 The successful acquisition of fundamentals is the cornerstone of continued technical, physical and mental development as the player moves through the developmental stages. After all, it is hard to enjoy and fall in love with the game if you can't consistently make and return shots. In addition to making the experience fun and teaching fundamentals, the primary mental skill to focus on in the early years of involvement is the enhancement of self-esteem via heavy doses of positive instruction and encouragement. If this does not occur, it leads to self-doubt, anxiety and motivation concerns in subsequent stages. In middle stage of involvement, the developing player must learn how to practice with purpose and intensity. She must further refine fundamentals and learn what it takes to become a positive competitor. Goal setting becomes particularly important in this stage. Players must not only learn to set goals, but the right types of goals (specific, challenging but realistic, outcome, process and performance goals). Players must also learn concentration skills, develop stress management strategies for dealing with the pressures that result from intense practice and play, and mental preparation strategies. In the third, world-class performance stage, the players must find ways to continually challenge and motivate themselves because performance gains will come at a slower pace. Learning to maintain focus and deal with distractions on and off the court are considerably important in this stage, as the successful player will spend more time in the limelight. Finally, the player in this stage must develop self-regulation skills. That is, while coaching is still critical, the player will be must learn to make decisions for herself and manage an increasingly complex physical and social environment. 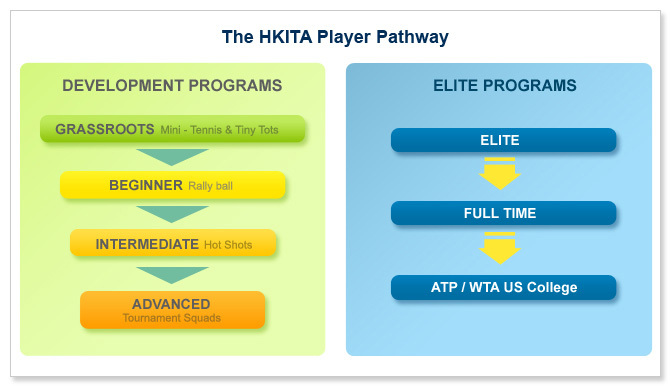 In summary, world-class players are developed through stages and those involved in tennis must understand these stages. Certain skills are emphasized during each stage and it is important that over zealous parents and coaches do not try to skip stages in an attempt to make players champions before they are ready. 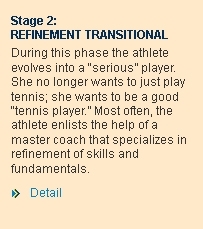 The development of tennis talent is a fragile process that takes time and quality support from all those involved.